Journey into the past through stories, pictures, and family history. James Augusta Trevathan was born on 19 February 1862 to Thomas Leander Trevathan and Sena Roberta Gallion in Trevat, a small farming community in Trinity County, Texas, which was settled by Thomas Leander Trevathan and his mother, Rhoda Leander, sometime around 1844 to 1845. Trevat was named for the Trevathan family and was in East Texas along the Alabama Creek which had previously been inhabited by Native Americans. My father told me that his father’s father was shot in the back and killed in a dispute over a quarter in a mercantile store in Trinity County and that his grandfather killed the man who shot him before he died. Unfortunately, that was all the details he remembered about the incident. This story always stayed with me and I hoped some day to find more information. My grandfather was not yet seven years old when he father was killed, so I doubt he was told all the details, and maybe never asked. I was only seven years old when my grandfather died, therfore I never had the opportunity to talk to him about it. So…I finally got around to researching James’ death. My sister, brother and I visited the area and did some research at the courthouse looking for information and records. 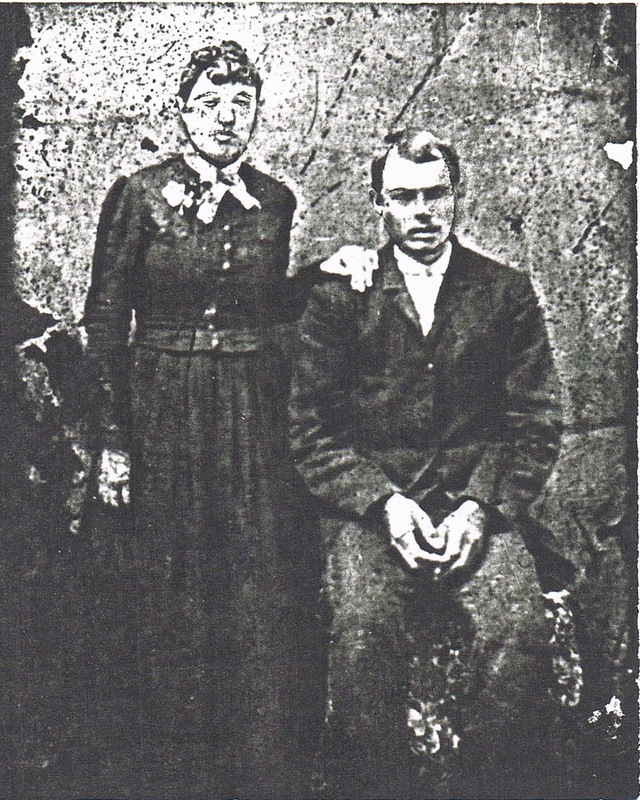 James married Lucinda Elvira Richardson on 27 February 1887 in Groveton, Trinity County, Texas. They settled in Trevat since that was where the Trevathans and Richardsons had their homesteads. James and Lucinda’s first child was born in 1889 and died shortly after birth without being named. They were soon expecting their second child who was born in 1890 but were once again saddened by the death of this infant. Two years later, they were blessed with the birth of a healthy son, Harvey David on 12 November 1892. On 14 July 1894, James and Lucinda were happy to welcome their daughter, Mary Frances (Mae), into their world. In 1897 Lucinda was expecting another baby but this time the sadness and tragedy doubled. Lucinda, at the age of only 27, died in childbirth, as did the baby. They are buried together in the Trevat Cemetery with the other two babies who died. James was now alone with the responsibility of raising Harvey, who was five years old and Mae, who was only 3 years old. Since there was a lot of extended family living nearby, he probably had help from his siblings, but it must have been a very difficult time. In the 1880 census James is still in the home of his father and working as a farm laborer. Since there is no 1890 census I don’t know if he was still farming but I do know he still lived in the same area because his father had given him some land. The biggest industry during this period was lumber and it is possible he worked at a saw mill. The saw mills brought many people to the area for work, as well as an abundance of saloons, and conditions grew worse for the citizens at the close of the century in Trinity County. At this time, Groveton was the county seat, and where people came to buy supplies but it was also the only town that permitted saloons. Drunkenness was common, as was fighting, and killing was one of the fine arts of the gunman. It reached a point at the close of the century that women and children never appeared on streets on Saturdays, and many Saturdays the merchants closed their places of business at noon and went home. There are no records left to tell me if James and his children were living in Trevat or Groveton but I’m sure he had to go into town for supplies. On Saturday, 22 April 1899, James went into one of the stores and had some sort of disagreement with the merchant, L. C. Harding. Edwin Harding, the brother of L. C., overheard the disagreement and went to his brother’s assistance and during the course of the argument James was shot in the back by Edwin. According to the papers, during the scuffle, James got L. C. Harding’s pistol and shot Edwin Harding, killing him almost instantly. James then turned and began shooting at L. C. Harding, striking him above the right temple. Apparently, the ball just grazed his head and he was not seriously hurt. James was shot a number of times in different parts of his body and died that day at the age of 37. He left a young boy of six and little girl of four orphaned. None of us will ever know the truth of what happened that fateful day. I wish I knew for sure that James was completely innocent and only acted in self-defense. This is what I want to believe of my great grandfather because his son grew up to be a gentle, kind-hearted man, as did his grandson, my father. We found no records at the Trinity County courthouse regarding the incident. The only thing I have found was a newspaper account which is where I got the names of the other two men involved and the few details. Fortunately, James had a very generous and loving sister, Catherine Roberta Trevathan (Aunt Cat) who took Harvey and Mae into her home and raised them. Many of the records for Trinity County, prior to 1900, are in a huge warehouse room in the back of the county clerk’s office in Groveton and in a complete state of disarray and deterioration. The clerks were hesitant to allow us in because the metal file boxes were stacked up high on unstable shelves in some areas and strewn in piles in other areas. They were apologetic and explained that there had been a fire some years before and apparently these were saved and put in this room but nothing more ever done. There is a wonderful Trinity County Museum in Groveton which is a very good source of information, and limited research. My source of information on Trinity County during this period of time was A History of Trinity County, Texas, 1827-1928 by Flora Gatlin Bowles. This entry was posted in 52 Ancestors Challenge, Surnames, Trevathan. Bookmark the permalink.